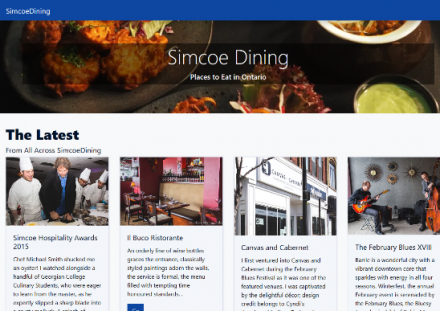 SimcoeDining - SimcoeDining is a directory and guide to restaurants across Canada. Address: 120 St. Patrick St. Description: Recreation, Travel, Guides and Directories - SimcoeDining. SimcoeDining is a directory and guide to restaurants across Canada. Learning Holidays (Popularity: ): Lists companies who provide educational or adventure travel, categorized by subject and academic program. Travel Directory By Tuttinsieme (Popularity: ): World travel directory furnishes anyone with every kind of information to travel around the world. Travel Notes (Popularity: ): Very organized travel directory providing country/state information, reviewed web sites, regular travel articles, and online ticketing. Onroute | The Travel Source (Popularity: ): Guide to vacations in the USA and Canada, including a virtual travelguide to cities. GetAway Network (Popularity: ): Directory of beautiful villas, resorts, and hotels, interesting places to go, sights to see, and things to do. TripSpot.com (Popularity: ): Directory of destination ideas, fare finders, reservation services, maps, hotels, accommodation, and travel statistics. Time Out.com (Popularity: ): Global travel and listings website Weekly entertainment listings from over 25 cities, plus travel features, on-line shop and special offers. TCI Search - Turks and Caicos Islands (Popularity: ): Travel information on the Turks and Caicos Islands.